The work is part of cooperative agreements between the Beltsville Human Nutrition Research Center (BHNRC) operated by USDA's Agricultural Research Service (ARS) at Beltsville, Md. ; Integrity Nutraceuticals International of Spring Hill, Tenn., and the Joseph Fourier University in Grenoble, France. Anderson works in the Diet, Genomics and Immunology Laboratory of BHNRC. ARS is USDAs principal intramural scientific research agency. For the study, conducted in Ohio, coauthor Tim N. Ziegenfuss, now with the Center for Applied Health Sciences based in Fairlawn, Ohio, enrolled volunteers and collected samples. Twenty-two obese participants with impaired blood glucose values--a condition classified as "prediabetes"--volunteered for the 12-week experimental research study. Prediabetes occurs when cells are resistant to the higher-than-normal levels of insulin produced by the pancreas (in an attempt to help remove elevated glucose levels from blood). 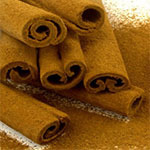 The study demonstrated that the water-soluble cinnamon extract improved a number of antioxidant variables by as much as 13 to 23 percent, and improvement in antioxidant status was correlated with decreases in fasting glucose, according to Anderson. Only more research will tell whether the investigational study supports the idea that people who are overweight or obese could reduce oxidative stress and blood glucose by consuming cinnamon extracts that have been proven safe and effective. In the meantime, weight loss remains the primary factor in improving these numbers, according to ARS scientists. More details on the study can be found in the Journal of the American College of Nutrition.